At last month’s NCTM conference, I came upon the American Statistical Association booth in the exhibit hall, and enjoyed discussing their resources for K-12 students. I had utilized a number of ASA’s many resources in the past, and encourage you to check out Chance Magazine and the ASA’s Project and Poster Contests for K-12 students. But Census At School was new to me, and I hope to encourage teachers in my district to utilize the wealth of data here. Issues: the site has an interesting slider where students communicate their opinion on a number of social issues. I have done many class data collection activities like these for years, but what excites me most about Census at School is the “Random Sampler” feature. With it, you can download a random sample of participating students, selecting what states, grades, and genders to include in the sample. The data can then be downloaded as an Excel document, and allows for myriad comparisons. To test drive this feature, I asked for a random sample of 50 high school students from Pennsylvania (my home state) and California. 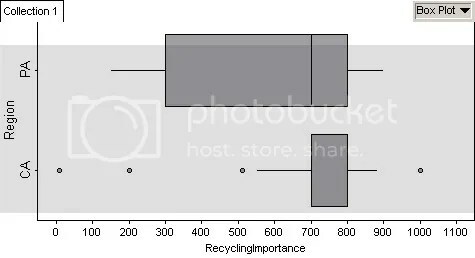 How do attitudes on recycling differ, between kids from PA and CA? 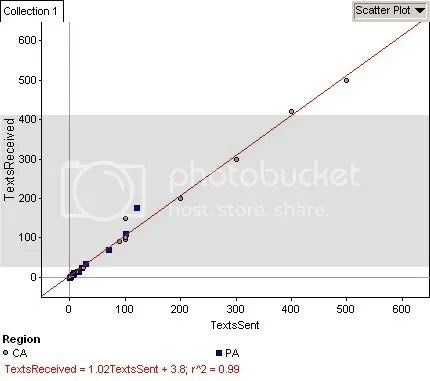 How do number of texts sent and receive differ in this sample of students? Looking for something active and productive to do with your kids in those last few school days? Set up some data collection stations, and contribute your class’ data to Census at School!